The cross of the Templar is a fairly well-known accent, one that any Templar or Crusader should be eager to show off. And with this Templar Cross Leather Belt, you can do just that, because it is a bold accent that features equally bold cross designs. This handsome belt is crafted almost entirely in 100% leather, and it comes in two colors, either black or dark brown, both of which look fantastic when compared against one another. The belt is segmented in a way, consisting of broad segments of leather linked by narrow connections. Each broad segment is decorated with a pewter-silver cross accent, as well as with engraved line designs that add a bit of unique design to the accessory. It also features a silver-metal buckle for easy fastening and wearing. The belt measures approximately 2.25 inches wide, making it a bit larger than the typical belt, too. 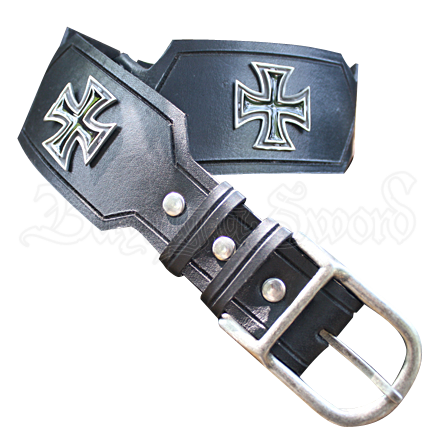 It is the perfect accent for any crusader or knight to wear about their waist, and with a bit of effort, this Templar Cross Leather Belt might even be an accessory that you can get away with wearing on a daily basis, too.